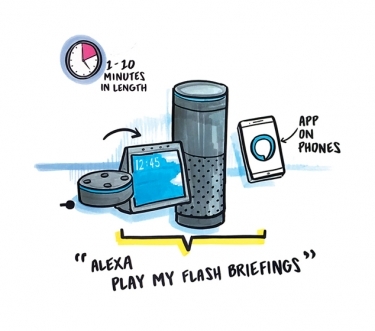 If you create your own Alexa flash briefing, you will reach a huge audience you would have never been able to reach before. As your audience grows, so will your revenue. In no time at all, hundreds and thousands of people hear you sharing little bits of your brilliance each day. You become part of their day. This is different than a podcast. 80 percent of all Amazon Prime Members have one of these devices. 100 million Amazon smart speakers have already been sold. Smart speakers are the most quickly adopted technology in history of the world. People can listen through their phones, too, via the Alexa app. You don't have to have the device to listen to flash briefings or to create flash briefings! ...like RAPIDLY growing your audience and your business with an amazing little thing called an Alexa flash briefing. Don’t know what the heck you would say? I can help with that. But just know that if you are a subject matter expert, and because these are just short little nuggets, tips, moments of inspiration that you share with your audience, once you start jotting these down on a legal pad, you’ll come up with months worth of content in no time. What is a flash briefing? It’s a small audio clip, less than 10 minutes long. ..but usually between 3-5 minutes. It’s the easiest thing you’ll ever create. So easy you can even record it on your phone. And upload. And publish. You can listen to these briefings through Amazon devices like the Amazon Echo, and the Amazon Dot. You just say, "Alexa, play my flash briefing." Alexa will then play each of the briefings that you have “enabled”. "MY AUDIENCE DOESN'T LISTEN TO FLASH BRIEFINGS"
Your CURRENT audience isn't listening. (Although that’s just temporary). For certain, though, your future audience is. Car companies are putting Alexa in their vehicles as standard features. Amazon is the second largest search engine AND it is the world’s largest store. Already you can purchase things with your voice through your Amazon device...soon you will be able to order directly from a flash briefing! Because people search Amazon for books and products, I have some keyword ninja tricks that will allow your briefing to get found on the big Amazon store when people go to search for something in your niche. If you haven’t fallen off your chair yet, consider this: Facebook just released their first piece of hardware, the Facebook Portal, and guess what they put inside? Alexa. This is an opportunity to finally be the early adopter who gets the head-start advantage. There are only 50K Alexa skills right now, with an even smaller number of flash briefings. Next year there will be 10x that amount. Now is the time to get your voice out there. If you’re thinking, “I don’t have time for this”, you do. This is why I love these BRIEFings so much. I’m going to show you how you can record, upload and publish 3 months worth of flash briefings in one sitting, After a couple of hours, not only is your daily content created and uploaded, it’s scheduled to publish each day, automatically, without you having to even think about it again. I’ve been doing this for a year and I have hundreds of regular listeners and they are now turning into clients and customers. How to set up your flash briefing so that it gets approved quickly by Amazon, has the right keywords to get found by listeners, and is branded perfectly. There are very few great briefings out there. They sound hollow and amateurish, for the most part.. I’m going to show you how to look like a pro from the very beginning. This is where I share my secrets for monetization, also. I’m going to show you how to publish and preschedule your flash briefings for automation. Set it and forget it! I will share with you how to repurpose your Flash Briefing most effectively, for multiple channels and how to get massive search engine optimization (SEO) for your website, how to leverage this if you are an agency, and how to use this internally (if you are network marketing leader, CEO, school principal, or scout leader!). I’m also going to show you how to market your briefing effortlessly so that the world knows about. No sense even doing it if no one is going to find it, right? Here you will get support from me and others. Also, you will be able to share your breifings with others and leave reviews for each others' briefings. Simple. I’m so passionate about this huge opportunity and I want every member of my community to hit the ground running with this! When I discovered Jen could teach me how to create an Alexa Flash Briefing - the easy way- I was so excited. I had already been researching the process. It was going to be hard and complicated... until Jen. She laid it out step-by-step, had identified software to make each part of the process happen without complicated anything. I was excited beyond explanation. Then, within a, matter of an hour or two, I had my first Alexa Flash Briefing ready to submit for approval. Amazing! I use the same exact process Jen taught me and now air my flash briefing, every weekday. It's so fun and my audience is impressed I've mastered this new, cutting edge way to deliver content. I'd recommend anything Jen teaches and her Alexa Flash Briefing course is no exception. Do it! Starting a Flash Briefing was easy once I followed Jen's instructions. It's a daily process that takes less than 10 minutes and fits into my daily workflow - record at night, then post first thing in the morning. Using Jen's strategy, after 2 weeks, I have 1,000 subscribers worldwide, adding at rate between 75 and 150 per day. Telling people "I launched an Amazon Alexa Flash Briefing Skill in the Amazon App store" has been a key differentiator between myself and similar people in my space, and exposed an entirely new audience to my work - all in less than 10 minutes per day. I LOVE, love love having an Alexa Flash briefing. For so long, I thought about doing one, but I was so stuck on the tech set up and couldn't think how I'd use a flash briefing in my business. Enter Jen Lehner!! Her step-by-step teaching style just makes everything easy!! Using her specific instructions, I went through the entire process of setting up, recording, and publishing my first Flash Briefing in a matter of just a couple of hours. Now, recording these daily only takes me 10 minutes!! It's so easy... and I'm having a blast! The cool part is, recording these little nuggets every day has made me fall in love with my own content again! These are so fun to produce (because it's easy! YAY!) and I can already see how my reach is expanding and others are finding out about me & my services because I am now DISCOVERABLE ON AMAZON. How cool is that?? Seriously, take Jen's course! She will walk you through everything you need to know -- and it's so much easier than you think! "TThis course was SO incredibly helpful! It covered absolutely everything you need to know about creating a flash briefing from start to end, and included several other helpful tips. It was easy to follow and definitely simplified things for this "non-techie" person. It was a ton of value for the price and I'm thrilled with what I learned! In just one afternoon, I did the whole course and created and uploaded my first flash briefing!"